Now in print at Amazon! Years ago I shared a thought with a friend, an incredibly awesome thought. He responded by saying that perhaps my "optimism had just gotten out of control." The phrase was so peculiar that it has stuck with me all these years. I am thankful for my friend's comment, which he has likely long forgotten. It served the good purpose of encouraging my deeper reflection. Also, the phrase has since developed a life of its own as the title of several articles in my DGJC.ORG/ZINGERS Optimism Out of Control series, and now this concluding Optimism Out of Control book. How far would optimism have to go in order to be out of control? I would like to think that I have a pretty good answer to that question, being a husband and father of four. As a younger man, I might have said it was impossible for optimism to ever get out of control. After all, God is for us, so who can be against us? True, our lives are never out of God's control. Yet God also commands us to exercise self-control. God has given his followers the mind of Christ to plan carefully while looking forward to the miraculous. We are not to optimistically leap off buildings flapping our arms expecting to fly, but neither are we to pessimistically conclude that we cannot fly. We are to optimistically trust God as we pray and work, fully expecting to fly. Ora et Labora! Pray and work! Optimism that has abandoned reason is out of control, and therefore out of bounds. However, optimism bolted onto the grace, truth, and power of God is unstoppable. In Romans 4:17b (WEB) we see that God "gives life to the dead, and calls the things that are not, as though they were." Our God brings things that are not into reality! If miracles are not optimistic, what is? 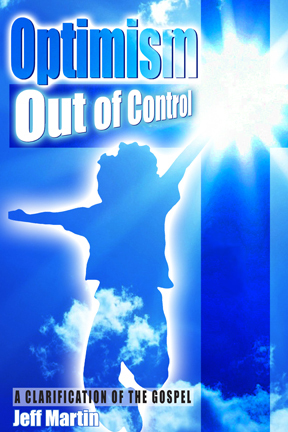 Since God has our backs covered, is it okay for our optimism to run out of control? He will nonetheless save us. True, God does have our backs covered and protects us from many of our foolish decisions. Yet he also tells us not to put him to the test in Matthew 4:7 (WEB), "Jesus said to him, 'Again, it is written, "You shall not test the Lord, your God." ' " Leaping off buildings, flapping our arms and expecting to fly, is not okay. Yes, God is in control, yet his sovereign demonstration of grace still allows for great tragedies in our fallen world. Nail-biting parents may take the joy out of life, and I may be such a parent at times. However, losses will come and can be quite painful, but foolish losses are especially painful. So it is not okay to allow our optimism to put God to the test. God will correct us for taking leaps that require miracles to bail us out. Yet he does command us to obey and he provides miracles along the way according to his wisdom. Thus we should fuel the fires of our optimism. But rather than let them explode out of control, we must focus our optimism with good planning directed toward purposeful targets, with self-control. Jesus Christ is your savior, my savior, and the savior of all mankind. That is it. That is my incredibly awesome thought. The thought is not my own, of course, but my understanding of the good news of Jesus Christ, as well as the understanding of a few good friends. My defense of this statement will be a thorough and surprising exegesis of the grand conclusion of New Testament grace theology found in the simply-stated verse of Romans 11:32. The thought is optimistic, but readers beware. The propositions of this book will challenge your current notions about faith, grace, Heaven, Hell, the Lake of Fire, and destiny. You are invited to post comments and questions online at each page or at DGJC.ORG/CONTACT. Also read alternate formats of Optimism Out of Control at DGJC.ORG/FORMATS. Turn the page to the Optimistic Outline and God bless! Embedded video for Optimism Announced!